Here is a radical proposition. Abolish all current taxes in India: by all I mean all the 50 or so different direct and indirect central and state taxes that exist in India. No income taxes, no corporate taxes, no capital gains taxes, no service tax, no excise tax. Replace all these taxes with one single consumption tax or what is commonly referred to as the value added tax (VAT). This one single act by the government of India will unleash productivity gains and prosperity that will wipe out poverty in less than ten years. Conservative estimates suggest that this would increase GDP by up to 20% ( from its current projected rate) and increase tax revenue collection by almost 40%. Taxes impede economic growth. Empirical evidence from almost 100 years of US tax data shows that there is a strong negative relationship between tax rates and government revenue. When tax rates are increased there is paradoxically a decline in the total revenue collected by the government. Conversely, when taxes are cut, total tax revenue has a strong tendency to rise. The economics of incentives tells us that when tax rates are increased two things happen. Firstly, people have a greater incentive to evade taxes because the increased benefit from evasion justifies the cost of being caught. Secondly, the incentive to work is diminished. In the extreme case of a marginal tax rate of 100%, there would be no benefit to working since any income from work would get taxed. This diminished propensity to work hurts the economy and reduces total tax revenue. What tax system would raise the revenue required to fund government spending at minimal distortion to economic growth? A growth-oriented tax policy has the following features: a recognition of the fact that high marginal tax rates are a disincentive to earning that income; lower marginal rates combined with significant penalties for cheating actually increase total tax revenue by increasing compliance; a broadening of the tax base by eliminating all loopholes and exemptions; and a simplified tax code greatly improves compliance and results in higher tax revenues. The Indian tax is anything but growth oriented. If I asked my business students to design the most ineffective system for raising taxes it is likely that the current system is the one they would design. Only about 2 percent of the Indian population pay any income tax, and less than 6% of companies recorded profits in excess of Rs 1 crore. In 2014-2015 almost 53,000 companies had an effective tax rate of zero because of hundreds of bizarre incentives, exemptions, and tax breaks. This resulted in a loss to the exchequer of about of Rs 65,000 crore. Combine this with the fact that the average Indian business spends 243 hours a year on tax related filings and it is clear that the Indian Tax Code is a model of inefficiency and adding new sections or tinkering at the margin is not going to fix it. If ever there was a perfect lose-lose system where all stakeholders lost the current Indian tax system would be it. 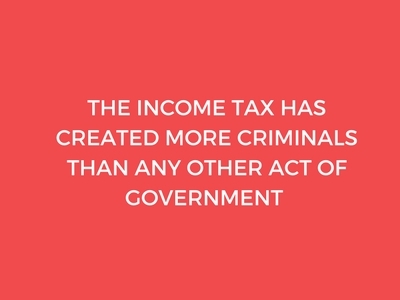 Government revenue collection is poor, tax evasion and black money are rampant, the amount of time and resources wasted by individuals and corporates in tax filing is enormous, and the resources expended by the government to ensure compliance is colossal. The only people who win in this chaotic tax system are the employees of the revenue and tax department, arguably the most corrupt organization in the country. A recent ( 2016) Word Bank Report ranks the Indian corporate tax code 157 out of 189 countries in terms of how helpful it is towards ease of doing business. The current tax system is hurting the Indian economy and killing Indian business.The system is broken and its time for a change. The economic growth that will be unleashed by the billions in capital that will come out in the open economy and be put to productive use, and the millions of hours that can now be shifted from filing taxes to being productive, will propel India into a world-class economy. Work by Harvard economist Dale Jorgenson using data from the US estimates shows that an efficient system of tax collection would increase GDP by 13 percent initially and an average of 9 percent over the long term. With the huge black money economy in India, these gains would no doubt be magnified. Lakhs of crores of stagnating capital will be released and put it to productive use. It is not unreasonable to expect an increase in GDP by 20% over a 5 year period and a 30%-40% increase in tax revenue collected by the government. It’s time for a new model to collect taxes in India. Let’s tear the current system out by its roots, and replace it with ONE SINGLE TAX, based on consumption: a value-added tax (VAT), that is automatically priced into whatever we consume. Imagine you cash your paycheck, all of it, with nothing deducted from it. You take what you need to pay the bills and buy what you need, and put the rest in savings. Under the current tax system, you report your income to the tax department regardless of whether you spend it or save it. In other words, a tax on income taxes not only what you consume but also what you save. What’s worse is that the money you save will be taxed again as interest from a savings account or a fixed deposit and or capital gains from investment in the capital markets or in a startup company. Under a VAT, by contrast, only the money you spend is taxed. The money you save and invest is never taxed. And that makes economic sense because nothing that impedes investment should ever be taxed. How is taxing of investments ever going to increase investment? A VAT tax is automatically added to anything you buy: the more you consume the higher the amount you pay in tax. The rich consume more and buy more expensive things and hence will pay a proportionately higher tax. Critics will argue that a VAT would make things more expensive and add to inflation. This argument is facetious because the myriad of taxes in India -income tax, corporate tax, excise tax, service tax, cess on this and cess on that –already make goods expensive. In fact, prices of goods will actually fall when all these taxes are removed (Dale Jorgensen). Getting rid of those taxes that penalize investing and saving will fuel an increase in economic growth, and lead to increased business competition. A more vibrant marketplace will make room for more competitors vying for your business with lower prices. The attraction of a consumption-based VAT tax is apparent from the fact that over 140 countries now use it as a form of collecting taxes. Another erroneous argument made against a VAT or consumption tax is that such as a tax would be regressive because the poor consume a larger portion of their income and hence would pay a larger share of their income in taxes. In fact, for the first time, everyone in India would pay taxes as they would all be consuming. And yes, it is true that the poor will consume a larger portion of their income, but food items could be made exempt from VAT. Better still, the government could use public funds to provide each low-income family a level of consumption free of tax by providing a rebate of the tax on expenditures up to the poverty level or some percentage above the poverty level. This would be a more neutral and less distortive approach than exempting certain categories from tax. In any case, it would be far easier to address the concerns of a VAT system than it would be to decipher the voluminous regulations of the current tax code. The VAT is a consumption tax that taxes the value added by businesses at each point in the production chain. It can apply to both manufactured goods and services. Because the VAT is a consumption tax, it mirrors the sales tax but is different in that a sales tax is collected only at the final point of purchase while a value-added tax is added at every stage of the production process. So if a consumer buys a pair of shoes a sales tax is added to the sales price, but a VAT is added all along the manufacturing process and is included in the final price. Every business simply maintains a record of VAT collected on sales and offsetting VAT paid on its purchases. Because a sales tax is collected at only one point in the production process, customers and sellers can easily cooperate to evade it. A VAT is more resistant to tax evasion because businesses collect and remit the tax at every stage of the production process. A tax trail once started cannot be easily broken without detection. The most common form of VAT is the credit-invoice method in which a business pays VAT on its purchases of inputs and collects it on its sales whether those sales are to another business or the final consumer. The business then submits the invoices that it receives from its suppliers to the government’s revenue agency. The invoices detail the amount of VAT that the business paid to its suppliers. Once the revenue agency verifies that the business remitted the proper amount of tax on its sales and that the submitted invoices match the suppliers’ filings, the agency refunds the business for VAT paid. The filings by businesses give the revenue agency a simple way to ensure that businesses pay the required amount of VAT. As long as the business can pass the tax on to its customers, which is typically the case, the business ultimately pays no tax. It acts solely as a collection agent for the government, collecting VAT on its sales and remitting to the government the difference between the VAT it collects and the VAT it paid on inputs. The burden of the tax moves up the production chain to the final consumer who bears the full burden, just like under the sales tax. A well-designed consumption tax is more neutral and does not affect the allocation of resources as dramatically as an income tax. Taxes are only assessed on the portion of income that is consumed (spent on goods, services, etc.). Since savings are not taxed it encourages people to save more, increases the available supply of investible capital, and ultimately produce a more solid, and robust economy. An income tax creates a barrier between the value of a person’s labor (how much they earn from working) and what they actually receive (money after taxes). This is a negative force on the economy because it causes people to work less. If there were no income taxes people would immediately see a real increase in purchasing power for each additional unit of time they spent working and would be more inclined to work. The barrier created by income taxes also produces fewer savings (because capital is taxed), reduces investment, discourages innovation, and ultimately contributes to a lower standard of living when compared to a pure consumption tax. The main argument against a consumption tax is that it would raise less revenue than an income tax if the two rates were the same. This is certainly true because savings would not be taxed in the consumption-based system. But that would be offset by increased production and consumption of goods that would accompany a greater accumulation of savings and investment capital and an economy that is fundamentally stronger than one using an income tax system. The VAT is clearly a better tax system than an income tax. It encourages savings, increases investment capital, is hard to evade and will reduce black money, is paid in some part by all citizens which broadens the tax base and above all has a low enforcement cost. Saving and investing are vital for economic growth because businesses use the capital to expand their operations. Entrepreneurs use them to begin businesses. Both activities create jobs and grow the economy.